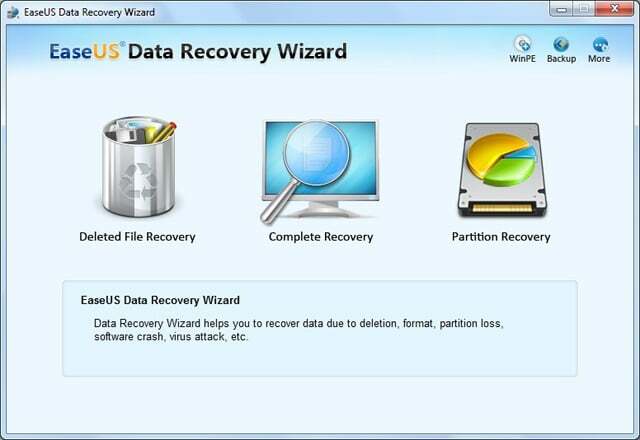 de CHENGDU YiwoÂ® Tech Development Co., Ltd.
EaseUS Data Recovery Wizard is the professional level, most cost-effective and easy-to-use data recovery software to recover data due to deletion, format, partition loss and other unknown reasons for Windows XP, 2003, Vista, 2008, Windows 7, 8, 10. It supports Unformat, Undelete files with various file systems environment including FAT, FAT16, FAT32, and NTFS on all storage media, such as hard drive disks, memory cards, digital camera cards, USB drives, flash card and other storage devices. It also supports Disk Image, compressed/encrypted NTFS files recovery, intelligent search and other operations for data recovery. Deleted File Recovery module can recover files and folders which are deleted accidentally with reasons or without any reasons. Complete Recovery module is used to recover files because of format, virus infection, software crash, and some other unknown reasons. With powerful format recovery function, it could be used to recover files from formatted drive disk or partition easily and safely. Partition Recovery module, different from Complete Recovery, is used to recover data from lost or damaged partition. For the users who formatted the disk by accident, EaseUS Data Recovery Wizard is the best choice for them. This data recovery software offers Complete Recovery especially for format recovery. With powerful format recovery function, it ensures safe and precise recovery for disk format recovery.